Rihanna performed at Wireless rocking a gold hexagon ring by Me & Zena. 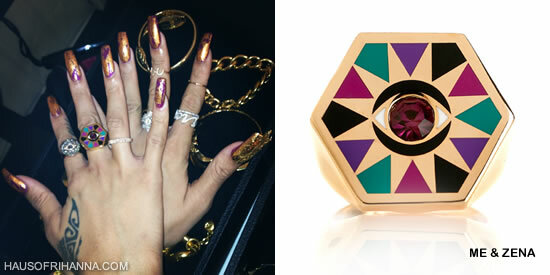 The I See You Hexagon Eye Ring went perfectly with the Egyptian theme that Rih has been working with. Her nails were done for the event by her UK manicurist, Jenny Longworth, who tweeted this picture of her handiwork. To recreate Rihanna’s nails, do two coats of a colour like OPI’s Purple With A Purpose or China Glaze’s Grape Pop then apply a coat of gold shatter polish such as China Glaze Cracked Medallion. Don’t forget to finish off with a top coat to protect your manicure.